It’s incredible how much work it takes to eat like a normal human being. One of the reasons I initially went to see Linda, my therapist, is that I no longer viewed food in the same way. I was very aware of everything that I ate. I couldn’t just sit down for a meal with friends, like it’s no big deal. It was a big deal, and the fact that I was so aware of the food on the table that it took away from my experience with friends was disconcerting. Why couldn’t I just sit, chat, have some bread with the yummy oily tomato sauce, engage in conversation, and eat my DELICIOUS salmon and sautéed spinach, without being distracted by how much I’ve eaten or being jealous that my friend was able to leave food on her plate. This is what I fantasize about. Stop eating when feeling full or satisfied? What a novel idea?! At least not yet. My nutritionist, Laura, said that that’s a very advanced step, being able to stop when you’re full. I practice it sometimes and am really proud when I do. I left over a piece of sushi once because I was totally satisfied and content. Without sounding cheesy, it’s SUCH an empowering feeling. The food didn’t control me because I made the decision to stop eating on my own. I’ve even thrown out bites of frozen yogurt a few times! (VICTORY. What was that? Do I want a cookie or a medal? I’ll take the cookie…) Laura has really helped me regulate my eating and stop focusing on food so much. Two things she suggested early on have been huge. Eat dessert once a day. She told me this during our first session. I have a major sweet tooth, and I would often have dessert in the middle of the day. I had not yet let go of the “last supper” mentality (this will be the last cupcake you eat because tomorrow it’s off limits, so get your fill today), so this turned into a string of midday treats. Also, I always obsessed about dessert after dinner and would feel incomplete until I had something sweet. She said dessert is like medicine for me. Oh, and did I take that and RUN with it! Not in an indulgent way. In a lovely way! I could have dessert every day! It helps me keep my cravings – and portions – at bay. If I want something sweet, I know I can have it later, and I can have it without guilt. One night, I got a DUNKIN’ DONUTS DONUT – the special pumpkin pie flavor for fall (disappointing by the way). I never would have done that without anxiety in the past. Laura thought that eventually, I might not even need dessert each night, because since I have it all the time, it becomes less of a “thing.” And she was right. There are some nights I don’t have it because I don’t crave it. I used to have episodes every 1-2 weeks in which I’d go a little nuts. Examples include: getting frozen yogurt twice on my walk home from school one night (mild); purchasing fro-yo at Yogurtland, more fro-yo at a coffee shop, then a cupcake, and then Yogurtland again, all within 5 hours (extreme); or eating a jumbo cookie after a final, followed by frozen yogurt after searching the streets, unsuccessfully, for an open pizza place at 10 am (moderate, and also pathetic). Anyway – I don’t think I’ve had an episode like that since Laura implemented this rule. Serving as a medicine, it’s one of the things that profoundly continues to help me. 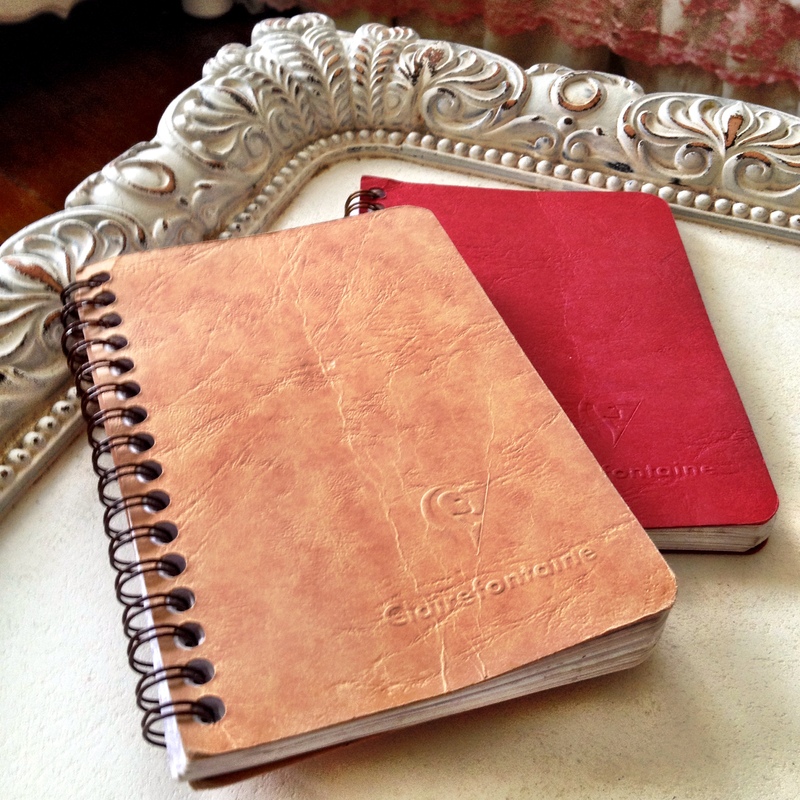 Keep a food journal. This is pretty common. It helps the nutritionist and client see what the client is eating, potential problems, what the eating schedule is like. Sometimes hunger and mood are included to see if eating is based on actual hunger or some kind of emotion/situation. Laura told me to include whether I’m hungry, which I did religiously. For example, I’d write, “8 am, up; 8:20, hungry, Kashi with peaches and almonds in almond milk; 11:30 hungry, clementine and string cheese.” I was actually really attached to my journal. I left it in a school lounge one day and literally clutched it to my chest when the security guard took it out of his drawer the next day. From October 10th of 2013 through June 1st of this month, I recorded every. single. thing. I ate. For me, this helped because Laura and I would go through my log each session and see if I was eating regularly throughout the day and if my meals were substantial enough to prevent hunger/cravings later. I learned that if I eat a small dinner, I pick later in the night and eat more. Or if I eat less than I should have for a few days in a row, it’s often followed by uncontrolled eating on a day shortly after. But lord, has this all taken work?! Winter break in Austin and LA led to weight gain, to which I did NOT react healthfully. It’s kind of funny looking back, and I’ll explain it at some point, but basically I had to regain control because I minorly freaked out. Linda suggested I put myself on an eating schedule, and Laura and I perfected it: Meal, 3 hours, Snack, 1-2 hours, Snack, 1-2 hours, Meal, 3 hours, Snack, etc. Basically don’t go more than 3 hours after a meal or 1-2 hours after a snack. I’m 28 years old, I’ve been eating meals my whole life, and I need to be put on an eating schedule in order to regulate my eating. With that said, it’s actually totally normal and typical for those with any level of disordered eating, but I realized the other day how much work it’s taken me to just … eat. 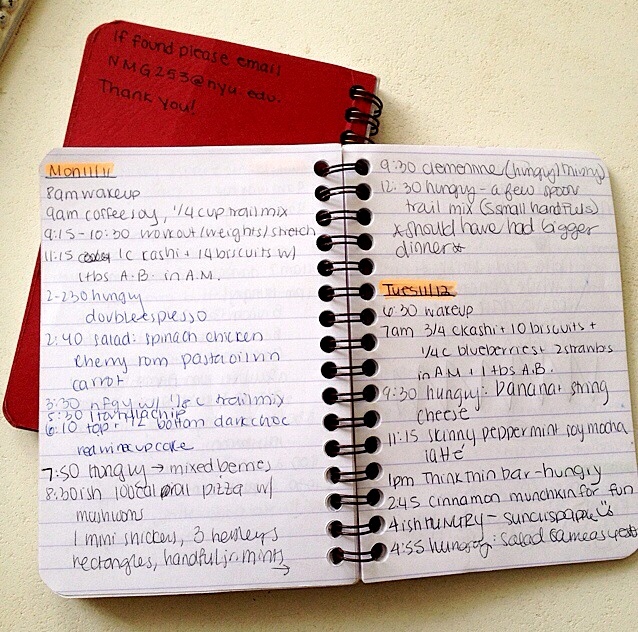 I saw Laura last week, and we decided I could try ceasing the food journal for a bit and see how I do. On my first day without it, I actually spent the first half of the day recording my hunger cues and what time I ate because I felt all out of sorts not knowing when I ate last. Then, I felt a bit freer, somewhat unchained from my journal. Now, one week later, I need to remind myself in my head when I’ve eaten so I can get a feel for how often I get hungry. This still takes some work, but eating without having to record it has begun to put me in the “eating like a normal human being” category, I would say. I’ve had healthy and unhealthy food fantasies. Juice fasts fall into the unhealthy category. But a healthier one is just being able to eat normally. To be able to go to dinners, parties, and special occasions without food being the focus. To just eat and engage, stop when I’m full, not agonize over or regret what I ate, not have the dessert buffet in the back of my mind. This entry was tagged counseling, diet, eating, journaling, nutrition, nutritionist. Bookmark the permalink.